Figure 1. Distribution of the Terra MODIS Thermal Anomalies/Fire 5-min Level 2 1-km swath (MOD14) pixels coincident with the ASTER Level 1B scenes. Fire influences global change and tropical ecosystems through its connection to land cover dynamics, atmospheric composition, and the global carbon cycle. As such the climate change community, the Brazilian government, and the Large Scale Biosphere-Atmosphere study in Amazonia (LBA) are interested in the use of satellites to monitor and quantify fire occurrence throughout Brazil. As multiple satellite and algorithms are being utilized, it is important to quantify the accuracy of the derived products. These data are from the paper where we evaluate the characteristics of two fire detection algorithms, both applied to MODIS-Terra data and both operationally producing publicly available fire locations (Morisette et al., 2005). The two algorithms are NASA's operational Earth Observing System MODIS fire detection product and Brazil's National Institute for Space Research (INPE) algorithm. We compare both to independent fire maps derived from 30m spatial resolution ASTER imagery. Quantitative comparison is accomplished through logistic regression and error matrices. Results show that the likelihood of MODIS fire detection, for either algorithm, is a function of both the number of ASTER fire pixels within the MODIS pixel as well as the contiguity of those pixels. Both algorithms have similar omission errors and each has a fairly high likelihood of detecting relatively small fires, as observed in the ASTER data. However, INPE's commission error is roughly three times more than that of the EOS algorithm. Jeffrey T. Morisette, Louis Giglio, Ivan Csiszar, Alberto Setzer, Wilfrid Schroeder, Douglas Morton and Christopher O. Justice. 2005: Validation of MODIS Active Fire Detection Products Derived from Two Algorithms. Earth Interactions: Vol. 9, No. 9, pp. 1–25. Data Set Contents: The output data are ASCII files where each row represents a MODIS fire pixel and the summarized information from the ASTER fire mask pixels within that MODIS pixel. The data files used for and resulting from this analysis are contained in 3 subdirectories. The directory input_inpe contains the input MODIS fire product derived from the INPE algorithm HDF files. The directory output_mod14 compares ASTER to the MODIS fire detection from the NASA/UMD algorithm. The directory output_INPE compares ASTER to the MODIS fire detection from the INPE algorithm. Input Files: The MODIS fire product derived from the INPE algorithm is provided in the files contained in the input_inpe directory as HDF files. "INPE.A2003028.1435.001.hdf" derived from the MODIS at-sensor scaled radiance swath data collected in year 2003, day 028, at 1435 GMT. Output Files: The output files reside in two directories; the first for the comparison of the ASTER fire mask with the standard NASA/Univeristy of Maryland fire product (output_mod14) and the second for the comparison of the ASTER fire mask with the INPE MODIS algorithm (output_inpe). Please note that there are *.asc and *.txt versions of the output files that differ in file format. See details below. Up to the first "." in the file name distinguishes between the MODIS/EOS and MODIS/INPE files. Between the first and second "." represents the day of the year for the MODIS data. Between the "-" and the third "." represents the unique component of the ASTER local granule ID from the ASTER scene used. The *.asc files are as received from the data provider. The *.txt files have been derived by the ORNL DAAC from the *.asc files. 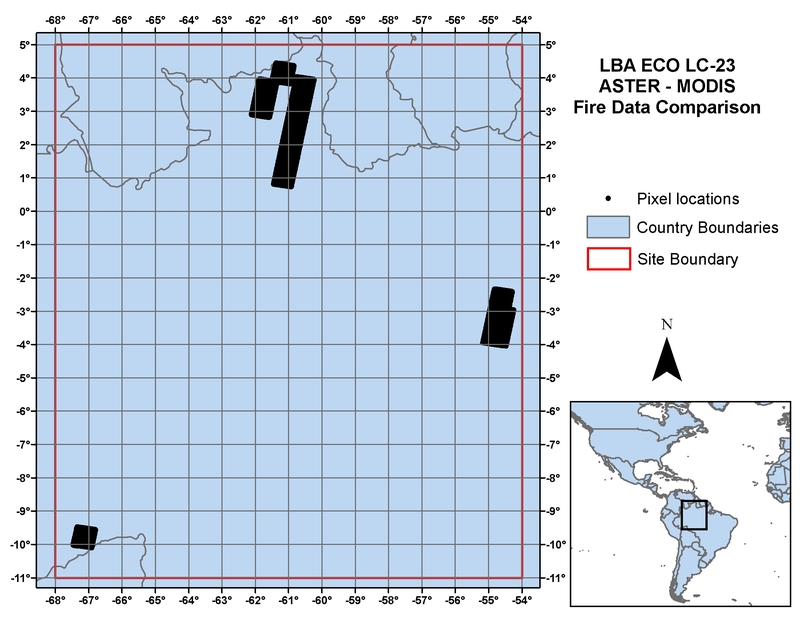 The standard MODIS fire product and original ASTER files are available through the Land Processes Distributed Active Archive Center (LP DAAC, http://edcdaac.usgs.gov/) and searchable via the filenames listed in the companion filelist.csv file, therefore, no attempt was made to create a redundant archive at the ORNL DAAC. Contents of the Output Files: The output data are ASCII files with header information (lines 1-4) and where each subsequent data row represents an individual 1km MODIS fire pixel and the summarized information from the ASTER fire mask pixels within that MODIS pixel. lines 5 through N+5 Where N = the number of MODIS pixels that have corresponding ASTER data. relX "relX" and "relY" are the pixel coordinates of the MODIS swath data, relative to the subset of MODIS data overlapping the ASTER image such that (0,0) is the upper left MODIS pixel for the overlapping area. Moran "Moran" is the Moran's I calculation for the ASTER fire data within the corresponding MODIS pixel. In *.asc files, formatted in scientific notation (e.g., 0.00E+00 and -9.10E-04). In *.txt files, decimal formatting (e.g., 0.0000000 and -0.0009100). variance "variance" is the variance of ASTER fire data within corresponding MODIS pixel. In *.asc files, formatted in scientific notation (e.g., 0.00E+00 and 8.28E-04). In *.txt files, decimal formatting (e.g., 0.0000000 and 0.0008280). MODIS band 21/22 brightness temperature "MODIS band 21/22 brightness temperature" is the 3.96 micron channel brightness temperature of fire pixel. Comes from either band 21 or 22; 22 saturates first, at which point we switch to 21. MODIS band 31 brightness temperature "MODIS band 31 brightness temperature" is the Band 31 brightness temperature of fire pixel. FRP "FRP" is currently unused -- set to 0. In *.asc files, formatted in scientific notation (e.g., 0.00E+00). In *.txt files, decimal formatting (e.g.,0.0000000). The output data records, where each row represents a MODIS fire pixel and the summarized information from the ASTER fire mask pixels within that MODIS pixel, are very sparse. That is, there are not many MODIS pixels with corresponding ASTER fire data. The following table provides summary statistics for each output file to characterize the relatively few coincident MODIS/ASTER observations and to enable users to verify data file transformations. Data are used to relate the MODIS fire detections (1km) with a 30m spatial resolution fire map derived from ASTER. Assessing the MODIS data quality is actual the purpose of these data. The ASTER fire map is assumed to be correct. While the accuracy of the ASTER fire map is not quantified, due to its spatial resolution is it assumed to be accurate enough to assess the 1km MODIS product. One should be careful, as we are in Morisette et al., 2005, to note that the data compare MODIS to ASTER fire counts (and do not compare MODIS to actual ground truth fire counts or fire size). MODIS (Kaufman et al. 1998) is a 36-band instrument with substantially improved capabilities for fire mapping as compared to the AVHRR. The first MODIS sensor is on board the Terra satellite, which was launched in December 1999 and has a daytime local overpass of about 10:30 A.M. The second MODIS sensor is on board the Aqua satellite, launched in May 2002, with a 1:30 P.M. daytime local overpass. One of the land products derived from the MODIS sensor is a pixel resolution fire mask, separated into files representing 5 min of image acquisition along a given swath (Justice et al. 2002). The increased saturation temperatures of the 1-km-resolution 3.9- and 11- m sensors decrease the ambiguities leading to false alarms or omission errors typical of the AVHRR-based fire products (Giglio et al. 2003). Starting mid-2002, daily processing of MODIS direct broadcast data began at INPE. INPE's satellite receiving station located in Cuiaba, Mato Grosso, in central Brazil receives Terra and Aqua imagery and disseminates that information to the Centro de Previsao de Tempo e Estudos Climaticos (CPTEC: Center for Weather Forecast and Climate Studies) in Cachoeira Paulista, Sao Paulo, where fire products are designed and implemented. The MODIS INPE algorithm relies on the well-consolidated methodology of fixed threshold algorithms (Setzer and Pereira 1991; Setzer et al. 1994; Setzer and Malingreau 1996; Li et al. 2001). INPE has successfully used this method with the NOAA AVHRR series of satellite data for nearly two decades. The daytime algorithm uses empirically derived thresholds. Pixels are classified as fire if two conditions are satisfied: band 20 > 3000 digital numbers (DNs) and band 9 < 3300 DNs. The band 20 test is used to determine pixels that are potentially associated with vegetation fires at the surface while the band 9 test is used to eliminate eventual sources of contamination that affect the fire product (e.g., bright targets). The nighttime algorithm requires one condition, band 20 > 3000. Text files with fire coordinates are disseminated to regional fire monitoring centers (e.g., PROARCO) and made available to the user community under a Web-based GIS system within approximately 2 h after the satellite overpass time (information online at http://tucupi.cptec.inpe.br/queimadas/index_modis.html). Fire detection within the EOS MODIS fire products is performed using a contextual algorithm that exploits the strong emission of midinfrared radiation from fires (Dozier 1981; Matson and Dozier 1981). Briefly, multiple tests are applied to each pixel of the MODIS swath that look for the characteristic signature of an active fire in which the 4- m brightness temperature, as well as the 4- and 11- m brightness temperature difference, departs substantially from that of the nonfire background. Relative thresholds are adjusted based on the natural variability of the scene. Additional specialized tests are used to eliminate false detections caused by sun glint, desert boundaries, and errors in the water mask. The algorithm ultimately assigns to each pixel one of the following classes: missing data, cloud, water, nonfire, fire, or unknown. A detailed description of the detection algorithm is provided by Giglio et al. (Giglio et al. 2003). In this study we used the Collection 4 level 2 (swath based) fire product, available from the Land Processes Distributed Active Archive Center (DAAC) via the EOS Data Gateway (http://edcimswww.cr.usgs.gov/pub/imswelcome/). ASTER (Yamaguchi et al. 1998), also on board the Terra satellite, provides near-nadir view measurements in four visible and near-infrared bands between 0.52 and 0.86 m, six shortwave infrared (SWIR) bands between 1.6 and 2.43 m, and five thermal infrared (TIR) bands between 8.125 and 11.65 m at 15-, 30-, and 90-m resolutions, respectively. The coincident high-resolution, multispectral measurements within a 60 km swath near the center of the MODIS swath provide a unique opportunity to analyze the finescale features within the MODIS pixels, such as active fires. In this study we utilized 22 ASTER Level 1B calibrated radiance scenes obtained through the NASA Earth Observing System Data Gateway (EDG) ( http://edcimswww.cr.usgs.gov/pub/imswelcome/ ). The companion file (filelist.csv) provides a table containing the file names that provide the unique identifier for each image data set for the Terra MODIS Thermal Anomalies/Fire 5-min Level 2 1-km swath (MOD14), the Terra MODIS Level 1A Geolocation data (MOD03; required input for proper geolocation of MOD14 swath data), and the ASTER Level 1B data. All of these data can be found in the EOS data gateway by searching for this file name as the local granule ID. Figure 1 shows the distribution of these scenes in space and the companion file provides details for the acquisition date, time, center latitude and longitude, cloud cover, and file name for each ASTER scene and the associated MODIS file names. Dozier, J. (1981), A method for satellite identification of surface temperature fields of subpixel resolution, Remote Sensing of Environment, 11:221-229. Giglio, L., J.Descloitres,., C.O.Justice, and Y.Kaufman (2003), An enhanced contextual fire detection algorithm for MODIS. Remote Sensing of Environment, 87,273-282. Justice, C. O., L.Giglio, S. Korontzi, J. Owens, J. Morisette,D. Roy, D., J. Descloitres, S. Alleaume, F. Petitcolin, and Y. Kaufman,( 2002), The MODIS fire products, Remote Sensing of Environment, 83, 244-262. Kaufman, Y. J., C.O.Justice, L.Flynn, J.D. Kendall, E.M. Prins, L. Giglio, D. Ward, W. Menzel, and A. Setzer (1998) Potential global fire monitoring from EOS-MODIS. Journal of Geophysical Research, 103, 32215-32238. Li, Z., Y.Kaufman, C. Ichoku, R. Fraser, A.Trishchenko, L. Giglio, J-Z. Jin, and X. Yu (2001), A review of AVHRR-based fire detection algorithms: Principles, Limitations and Recommendations. In Global and Regional Wildfire Monitoring from Space: Planning a Coordinated International Effort. Edited by F. Ahern, J. Goldammer and C.O. Juctice. SPB Academic Publishing, The Hague, The Netherlands, 199-225. Matson, M., and J. Dozier (1981), Identification of subresolution high temperature sources using a thermal IR sensor. Photogrammetric Engineering and Remote Sensing, 47,1311-1318. Morisette, J.T., Louis Giglio, Ivan Csiszar, Alberto Setzer, Wilfrid Schroeder, Douglas Morton and Christopher O. Justice (2005), Validation of MODIS Active Fire Detection Products Derived from Two Algorithms. Earth Interactions: Vol. 9, No. 9, pp. 1–25. Setzer, A. W., and J.P. Malingreau (1996), AVHRR Monitoring of Vegetation Fires in the Tropics: Toward the Development of a Global Product. In Biomass Burning and Global Change, Vol. 1: Remote Sensing, Modeling and Inventory Development, and Biomass Burning in Africa, edited by J. S. Levine, pp. 25-39, MIT Press, Cambridge MA, USA. Setzer, A.W., A.C. Pereira Jr, and M.C. Pereira (1994), Satellite studies of biomass burning in Amazonia: some practical aspects, Remote Sensing Reviews, 10, 91-103. Setzer, A. W., and M. Pereira (1991a), Operational detection of fires in Brazil with NOAA-AVHRR. Proceed. 24th. Int. Symp. Remote Sensing of Environment, R.Janeiro, 27-31 maio, 1991, vol I, pp. 469-482, ERIM, Ann Arbor, Michigan, USA. Yamaguchi, Y., A.B. Kahle, H. Tsu, T. Kawakami and M. Pniel (1998), Overview of Advanced Spaceborned Thermal Emission and Reflection Radiometer (ASTER). IEEE Transactions on Geoscience and Remote Sensing, 46, 1062-1071.